AEON Kyushu has 15 branch schools located in all of the 7 prefectures of Kyushu Island and Okinawa. The Head Office for AEON Kyushu is located in downtown Tenjin, which is one of the busiest terminals stations in Fukuoka City. The region can be divided into three distinct parts; Northern Kyushu (Kyushu Hokubu), Southern Kyushu (Kyushu Nanbu), and Okinawa. Northern Kyushu, which consists of Fukuoka, Saga, Oita, and Nagasaki, has a large population base. As for its climate, Northern Kyushu has hot, humid summers and relatively mild winters. Temperatures usually reach 30 °C (86 °F) in the summer while it rarely drops below 0 °C (32 °F) during winter months. Southern Kyushu, which consists of Kumamoto, Miyazaki and Kagoshima has more of a “countryside” feel. This region has more of a subtropical climate. During summer months, temperatures usually reach about 33 °C (91 °F) and 7°C (44 °F) during the winter season. The island of Okinawa has more of a humid subtropical climate. 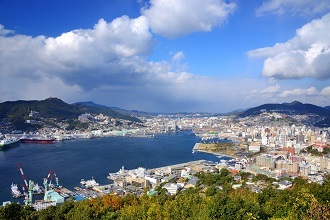 The city of Naha has hot and humid summers and warm winters. The average low for the area hovers around 15 °C (59 °F). Most of the AEON students are either business people or children, but a good number of the student-body also consists of college students and housewives. Kyushu branch schools cater to various kinds of students and help them with their goals and needs. Many of the adult students study English in order to communicate with foreign clients, to go on lengthy business trips and to keep their level of proficiency. Additionally, a good number of students are enrolled in the J-Shine program, which provides certification to teach English to children in public schools upon completion. In nothern Kyushu, Saga and Oita Prefectures have many hot springs and one of the most popular hot spring destinations is in Beppu City. 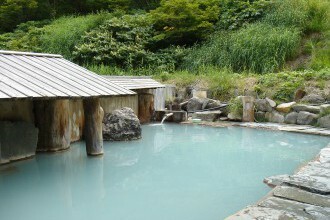 In addition to the normal hot springs, Beppu is also famous for its abundance of foot baths and even sand baths. Nagasaki Prefecture has been involved in international trade for hundreds of years and evidence of this history is present in its architecture. Kumamoto Prefecture lies towards the middle of Kyushu. 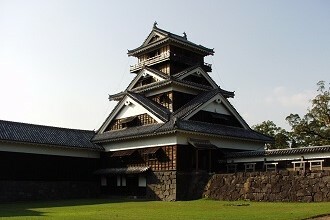 Kumamoto City is one of the larger cities on the island providing many different opportunities and activities. The enormous black-sided Kumamoto Castle rises up from the city and is regarded as one of the must-see castles in all of Japan. The prefecture is also home to Mt. Aso, an impressive volcano. On days when the wind is blowing in the right direction, tourists are able to take a rope-way to the top of the crater and peer down into the massive hole. Many traditional Japanese inns called ryokans have been built on the slopes of Mt. Aso to take advantage of the mineral-rich, naturally-heated water produced by the volcano. Some of the baths offer thick reddish water which is said to be very good for the skin. Miyazaki and Kagoshima Prefectures offer mid-sized cities with many activities, as well as the ability to get out of the city areas easily and into the countryside. Yakushima, an island off the coast of Kagoshima is a popular destination for those who want to explore pre-historic looking forests. The sub-tropical climate mixed with an abundance of rain allows plant life to flourish and makes a unique experience for its visitors. Okinawa Prefecture is another popular tourist destination in Japan for different reasons. The crystal clear warm tropical waters surrounding the island make Okinawa an inviting place for summer travelers, especially those interested in beaches, scuba diving and other water sports. Since Okinawa is some distance from the rest of Japan, the people there have developed their own culture and foods. The architecture of its castles, temples and shrines also differs somewhat from that in the rest of Japan. Food from Kyushu is also famous all throughout Japan. 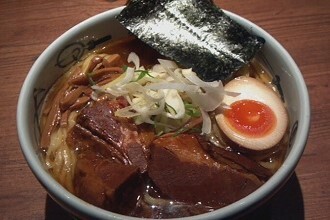 When people think about Kyushu and food, the first image that comes into their minds is ramen. Tonkotsu Ramen is extremely popular and delicious. People will line up for hours to eat at the best ramen shop. Because of this demand, Fukuoka City has many street vendors that sell ramen. These stalls get especially crowded at night and generally it is standing room only. Kyushu also offers different styles of nabe which are not commonly found in other locations in Japan. Nabe is a one-pot dish where different ingredients are cooked together in a broth. When the first round has been finished, more ingredients are added and one can keep eating until very full. Nabe is eaten throughout the year, but more popular in the winter because after eating nabe one feels warm inside. In Kyushu, the most famous style of nabe is motsu nabe, which is made from cow giblets. Even though nabe is more often eaten during colder weather, motsu nabe goes great with cold beer and therefore popular in the summer. Because of how much people love motsu nabe, restaurants that just specialize in that one dish have sprung up all over Japan. People from Kyushu celebrate several festivals that are distinct from other places in Japan. Fukuoka’s Hakata Gion Yamakasa is considered the most “intense” festival of the prefecture and attracts up to a million spectators annually. Kumamoto’s Aso Fire Festival has traditional art performances, fireworks displays, and an impressive fire display on its mountain slopes. In Saga, one can try making pottery or check out the “International Hot-Air Balloon Festival” held every November. For teachers who like delicious food, great people and an exciting balance of natural beauty and exciting cities, Kyushu is perfect. Click for more information about certain school locations in the Kyushu region and comments from our teachers.